For my twenty-second birthday, my brother gave me a Kindle. “It’s easy,” he said, being perfectly honest. But at that point in my life, I was only reluctantly coming out of the dark ages and still unable to admit (or foresee) that smart phones and tablets and would become reading, writing and sharing platforms of the future. My brother had the iPhone. I had a cellphone which I used occasionally to call my parents and to send text messages that were about as clunky as snail mail. I had to scroll and open each message individually. And I think each month, I was limited to 200 texts. In theory, giving your sister who (purportedly) loves to read a lightweight portable e-reading device that could relieve her from having to haul heavy books to and fro is a good idea. In theory her face should light up with gratitude and she should say, “Golly gee brother, this here is the greatest gift since my friends gave me the Cuisinart Ice Cream Maker when I was twenty-one!” (By the way that is still by far one of the greatest birthday gifts I’ve ever received). But my brother’s sister was then, a cavewoman who if not for her evolutionarily well-adjusted brother , would still be living in the dark ages. It was he who set up all her computers, taught her how to use Microsoft Word and the Internet and email, and it was he who, when she graduated high school, bought her an engraved iPod, so that she would feel at one with the rest of the student hipster body. She filled the iPod with the soundtracks of Disney movies and “Titanic,” and understandably, still felt very estranged from the rest of her classmates who had long moved on to the likes of “The Postal Service” and “The Strokes”. Even with these technological advances tucked not so securely under her belt, she approached the Kindle with a wary expression (like Homo Erectus approaching fire) turning it on, then off, then on, and then off with the sinking feeling that she’d never understand it. What was the appeal? She felt the little buttons, lifted it up and down (Light as a feather! Really, could all seven Harry Potters could be stored in this slim apparatus?) and scrolled through the relatively easy to navigate menu, sensing the convenient possibilities. But the idea of registering it to a website she barely used (never mind that now I am addicted to the entertainment offerings of Amazon Prime) and having to choose books without first being able to flip through them, read the inside flap or most importantly, smell the paper... it frightened her. Not to mention there was a towering wall of unread books behind her, which she had lovingly built with volumes bought from used bookstores and public library castoffs. She couldn’t very well abandon it now, could she? It stood as a monument (and glaring reminder of) to her intellectual (and extremely unmet) potential. If she used the Kindle for its intended purpose, she’d never get around to tackling those books and she would have failed, essentially, as a reading human being. But still, her brother had thoughtfully given her something he she might appreciate and she said “Thank you.” She left the Kindle on her desk, resting snugly in its box, to study for a later time. “Sure,” she said, knowing what would come next. Her brother would grow accustomed to the little tablet’s convenience and lightness and without realizing it make his own the gift he had intended for his sister. Not that she minded. She was too busy blogging and reading paper books. But then her brother bought the new iPhone, passing down his old one to her, and then he bought an iPad and things started to look bleak for the Kindle. Her brother didn’t need an iPad and a Kindle, especially when the former could be fitted with a Kindle App, so suddenly use of the Kindle, by anyone, came to a silent halt and thus it sat, languishing in a corner of her brother’s Shanghai apartment in Shanghai, collecting the dust of a billion plus one cars. Around the time my brother prepared to returned to the States for a brief visit involving my grandmother’s funeral and his wedding – yes, in that order – I had started using the Readability app on my iPhone, which was given to me around my 25th birthday and marks, along with my foray into online dating, another minorly major milestone in my life (but that is a story for another time). Readability is, after Instagram and Camera Plus, my favorite app on the iPhone for it has the amazing ability to make readable (hence the name) long magazine and blog articles that otherwise would have burned my eyes out from sheer exhaustion. The app makes fonts and background uniform and saves my having to zoom in and out with unwieldy fingers. It is great, but as my reading lists grew longer and longer my iPhone screen remains very small and sometimes, a little too bright. I noticed the Readability app had an option, when saving articles, to “send to Kindle” and remembered that I too, in name at least, owned a Kindle. But he dutifully brought it back. And so it was, after traveling from China (where it was assembled) to Villa Park, CA (where it was gifted), back to China (where her brother lived and worked) and back to Villa Park, CA (where his parents and sister still lived), the Kindle had found another loving owner. Or so it thought. Once I held it in my hand again, the feelings that had originally overwhelmed me came rushing back. I was now an avid user of Amazone Prime and felt confident navigating the offerings of my iPhone, but the Kindle threatened to complicate all that. I set it on my bookshelf once more, dooming it to obscurity for another six months. Until recently. Lately I’ve been letting a lot of articles go unfinished. Reading, that is. It bothers me and doesn’t accurately represent me as a person, because as a person, I like to finish what I start. (You there, coughing “unfinished blog posts” and “part-time jobs” and for many years, “higher education,” do me a favor and shush.) But I’ve been going to bed with sore eyes and alarmingly over-heated fingertips from touching my phone screen too long, scrolling through Longreads that I just can’t finish because I’m getting bleary-eyed. So the Kindle. I deregistered my brother’s name yesterday and registered my own. 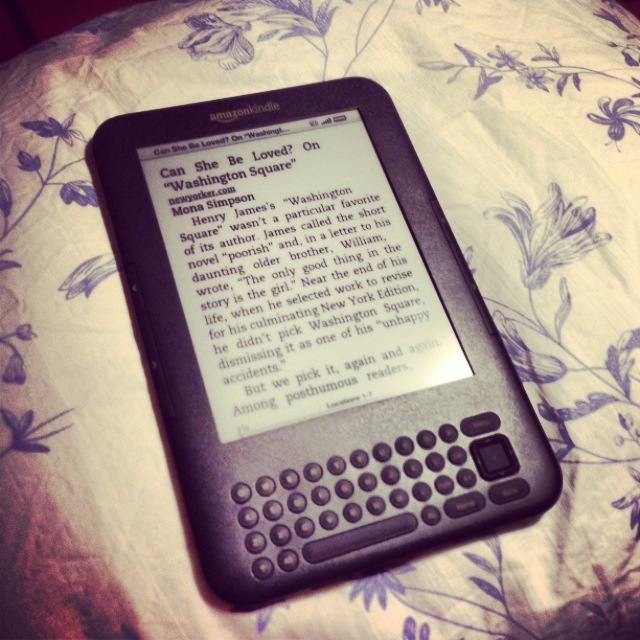 I set up a “send to Kindle” email address and allowed documents from readability access to my Kindle. It has changed my life. Last night, I finished reading every single article I had saved from earlier in the day. I feel not only smarter because I absorb information better when I’m not bleary-eyed, but also more accomplished because I’m finishing what I’m reading. And accomplished because I just spent an afternoon writing about the Kindle. Yeah. Anyway, thanks Guh, for the great gift. I am finally living in 2008.